Biffle milked a 30-yard stretch loaded with bronzebacks to win the BASS Elite Series event on the Mississippi River over the weekend. He’s been all over the map with his finishes this year (and most years, lately), but the win makes five straight years with a win in a Major, so it shouldn’t come as much of a surprise. So where does he rank? Well, the win, combined with the 2011 Wheeler Lake event dropping off boosted Biffle up 13 spots to No. 70 in the Majors Ranking this week. Just as notable is the look of the top 10 after this weekend. Andy Morgan is still firmly planted at No. 1, and Edwin Evers’ 11th in Lacrosse, Wis., helped him climb two spots to second. 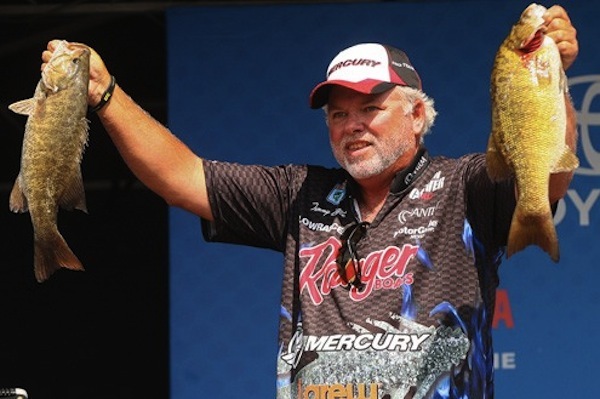 But the big story is Kevin VanDam, who dropped a second-place finish at Wheeler and finished 24th over the weekend to slip into a tie for his lowest placing ever in our rankings — sixth. Not that that’s a far drop, but for him it’s still noteworthy. Meanwhile, FLW Tour pros were also moving around thanks to a 2011 Kentucky Lake event dropping off. Without that event, Jacob Powroznik (No. 4) and David Dudley (No. 8) both rose to spots while Cody Meyer (fifth to seventh) and Mark Rose (eighth to 11th) slipped. Throw in Todd Faircloth jumping back into the top 10 in fifth and Ott Defoe slipping to No. 10 and it was a busy week at the top of the ranking. Needless to say, with that much movement there is no way to mention all the notable moves in the top 50 without writing a novel, so you’ll have to check out the ranking yourself. Still, we will highlight a few key moves, such as Aaron Martens. A year ago he finished second at the Mississippi River, and this year he accomplished the same feat. Plus, his history of finishing No. 2 is well documented. Still, he rose 16 spots this week to get back in the top 20 at No. 18. Another big move was Alton Jones. He finished 20th this weekend, but he also dropped a clunker of a tournament at Wheeler. The result was a 21-spot improvement from 52nd to 31st. John Crews also had himself a weekend, taking third and then moving up 15 spots in the ranking to No. 40. And we’ll finish it off on one last positive in Bobby Lane, who finished seventh to 18 spots to 47th.